In African societies, especially Yorubaland, coronation is a historic event that attracts guests from far and near. Such an occasion usually has in attendance the rich, the poor and the cream of the society who share cultural or familial lineage with the host community. The planning for the eventful ceremony is usually novel and elegant in order to make the D-Day a memorable one. And the reason is not strange; traditional rulers are living embodiments of prestige and reverence. They are custodians of culture and a rallying force among people of different strata. He had bought seven different expensive clothes to wear on the day. And it was going to be a dress per moment, Saturday PUNCH learnt. Already, there were bookings for drinks, catering service, musical show and ‘Aso Ebi’ (a dress chosen as the general attire for guests) for hundreds of potential attendees. “It all started like a mere cough that Monday morning. He was given medications. But his health deteriorated and we decided to rush him to the hospital. He died on the way,” the late monarch’s first wife, Bisi, told Saturday PUNCH amidst sobs. For about two minutes, the mother of eight could not continue the talk with our correspondent. She was devastated. After much succour from sympathisers around her, she managed to pick herself up. She stifled her tears to resume the narration. She continued, “I hardly slept at night due to the stress of the preparation. After praying in the morning, I would go back to sleep. That Monday morning, while I was asleep, one of our children woke me up. He asked me to come and look at Kabiyesi (the monarch). It was around 11am. When I got to his room, he was coughing. He took some medications but there was no improvement. So I called one of his sons, Sola, on the telephone and informed him about the situation. A nurse had already put him on a drip. 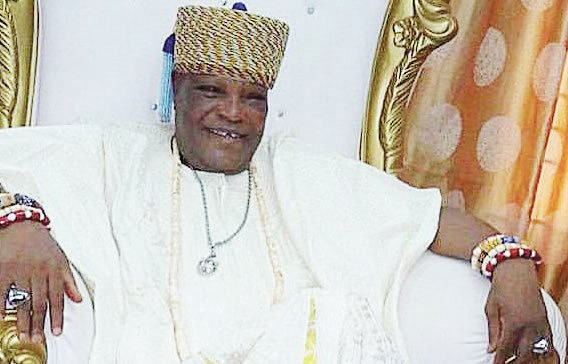 Saturday PUNCH learnt that some days before his death, the monarch had installed some new chiefs, including Iyalode (a prominent chieftaincy title for women) that would work with him on the throne. One of the children, Sola, who also doubled as the personal assistant to the monarch, shared the fond memories he had with his father during an interview with Saturday PUNCH earlier in the week. Sola lamented that his father laboured hard to clinch the new title, adding that it was sad he did not live to enjoy the throne. He said, “Kabiyesi was into estate management. He was a nice father to me. I relocated from abroad in 2010 when things were not going fine and I started working with him. I was in charge of most of his properties and he paid me for my service. We were very close. When we had any misunderstanding, we would settle it amicably. I don’t know how I would live without him. “He was very caring. As many as we (the children) are, he sponsored our education up to tertiary level and ensured that we were united. Even when I returned from abroad with nothing, he embraced me. May his soul rest in peace! At the entrance of the palace, a condolence register was opened for the late monarch where sympathisers wrote inspiring notes about him and wished him eternal rest. While Islamic prayers were being held within his palace, a seven-day ritual procession (oro) was being observed around the community, starting from Tuesday. During the days, no movement will be allowed in the community from 11pm till the early hours of the following day.